The Evenflo Folio Travel System featuring the LiteMax Infant Car Seat is fully featured to meet all your parenting needs. It includes full-size luxury that is sleek and stylish for the modern parent. This unique stroller has "N" accordion style fold. Parents can fold the stroller to ⅓ the size of traditional full-size strollers quickly and easily. The fold is activated by the strap in seat which allows for quick, one handed operation. The Evenflo Folio Travel System is not only advanced for a compact stroller, but also with the features it has to offer The LiteMax Infant Car seat has been rollover and side impact tested to provide safety where your child needs it most. The base includes an integrated belt lock-off system which provides peace of mind that the base is securely and correctly installed. The LiteMax Infant Car Seat can accommodate child between and 4 – 35 pounds (Strollers maximum weight is 50 pounds). The LiteMax Infant Car Seat has a full canopy and comfortable infant head support. Parents can easily install the Infant Car Seat base with the belt-lock and 4-position recline which provides an easier and more secure seatbelt install. 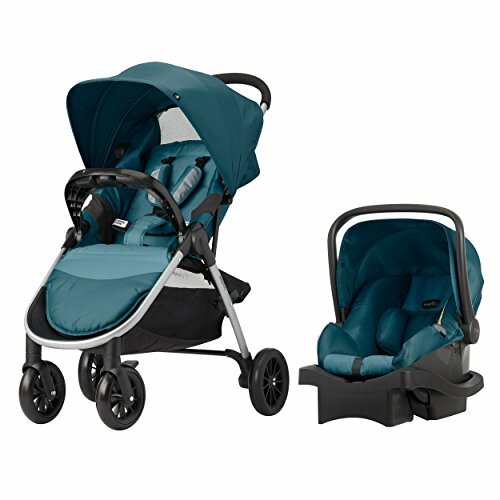 Ready, set, go - car seat moves from base to stroller with one secure click. The unique ergonomic handle is designed for carrying in the bend of the arm, exactly how most parents carry it.